Brief Description: Are you a member of a pub quiz team? Do you enjoy having a go at general knowledge quizzes? Are you knowledgeable about a wide range of subjects? Whatever your reason for choosing this book, you are certain to enjoy tackling the 500 questions inside. Which Author and politician with the middle name Rodham wrote Living History? The Tamla Motown music label founded by Berry Gordy Jr. began in which American City? What object sits on top of the Wimbledon men’s singles champion trophy and has done since 1887? If these questions have got you puzzling, dip inside to find out the answers and discover more of the same. With sections on all areas of general knowledge including art and literature, film and television, history, music, science, sport, inventions and much more, there is something to suit all levels of ability. Whether you are a quizmaster in need of new material or genning up for the next pub quiz, The Ultimate Pub Quiz Book is an ideal way to improve your general knowledge. About the Author: Scott Stevenson is an actor, author and artist. He was born in Bath in 1983 and grew up in rural surroundings, close to the Mendip Hills. He has a 2:1 bachelor degree in Environmental Science from Bath Spa University. After spending a number of years managing a team supporting children and young adults on the autistic spectrum, Scott followed his dream of working in the film and television industry. To date he has appeared in nearly 200 productions including featured roles in commercially successful movies such as Les Misérables, Muppets Most Wanted, Mission: Impossible 5 and The Imitation Game and well-loved television series, most notably Doctor Who, Downton Abbey and EastEnders to name but a few. Scott also paints commissioned artwork, writes children’s stories and likes to watch his beloved Liverpool FC play. He also participates in local pub quizzes across Somerset and frequently composes quiz questions for social functions – a pastime which has led to him publishing quizzes for quizmasters across the country. Scott lives in Midsomer Norton, in Somerset, where he enjoys spending time with his young family. 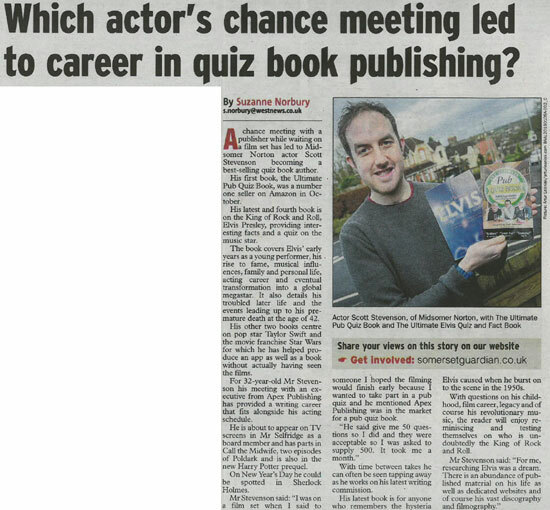 A chance meeting with a publisher while waiting on a film set has led to Midsomer Norton actor Scott Stevenson becoming a best selling quiz book author. His first book, the "Ultimate Pub Quiz Book" was a number one selling book on Amazon in October. His latest and fourth book is on the King of Rock and Roll, Elvis Presley providing interesting facts and a quiz on the music star. The book covers Elvis' early years as a young performer, his rise to fame, musical influences, family and personal life, acting career and eventual transformation into a global megastar. It also details his troubled later life and the events leading up to his premature death, at the age of 42. His other two books centre on popstar Taylor Swift and the movie franchise Star Wars for which he has helped produce an app as well as a book without actually ever having seen the films. For 32 year-old Mr Stevenson his meeting with an executive from Apex Publishing has provided a writing career that fits alongside his acting schedule. He is about to appear on our television screens in Mr Selfridge as a board member and has parts in Call the Midwife and two episodes of Poldark and also in the new Harry Potter prequal. On New Year's Day he could be spotted on our screens in Sherlock Holmes. Mr Stevenson said: "I was on a film set when I said to someone I hoped the filming would finish early because I wanted to take part in a pub quiz and he mentioned Apex Publishing was in the market for a pub quiz book. "He said give me 50 questions so I did and they were acceptable so I was asked to supply 500. It took me a month." With time between takes he can often be seen tapping away as he works on his latest writing commission. His latest book is for anyone who remembers the hysteria Elvis caused when he burst on to the scenes back in the 1950's. With questions on his childhood, film career, legacy and of course his revolutionary music, the reader will enjoy reminiscing and testing themselves on who is undoubtedly the King of Rock and Roll. It is available in two formats, eBook and paperback. He said: "For me, researching Elvis was a dream. There is an abundance of published material on his life as well as dedicated websites and of course his vast discography and filmography." 'The Ultimate Elvis Quiz and Fact Book' has been published in paperback, priced at £5.99, and in all eBook formats, priced at £4. Great fun to try on friends and family. A must for quiz fans everywhere. Those who think they know everything will be shot down in flames with this book in the hands of the question master! 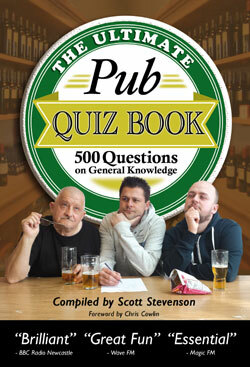 If you like quizzes in pubs and books, then you'll love this. It's the Swiss army knife of quiz books. Everything a quizmaster could need while also being an ideal read for the casual quizzer. Being someone who presents quiz nights nationally on a regular basis, this book is essential for not only the quiz but a great source of education. This is great book, well researched questions, interesting content. Even makes me sound intelligent. Hours of fun to be had, challenge your friends, family and work colleagues, a must for all quiz lovers. They say Knowledge is Power, so become all-powerful with this book. This is a must for all quiz lovers. Pubs are great. Quizzes are great. Pub Quizzes are brilliant. Ergo this book is brilliant. Like quizzes? This is everything you need! An essential. What isn’t in this book isn’t worth knowing! Don’t even think about entering a pub until you’ve read this! You’ll be in with a much better chance of winning if you give this a look. Great fun to do at home as a practice before the pub! A great way to find out who listened at school, and who was the fool. 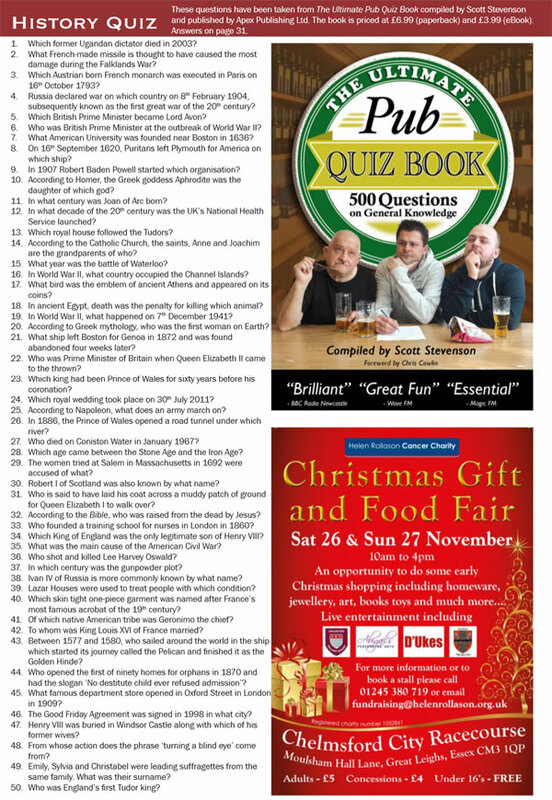 A must for anyone who has a Sunday lunchtime radio show on BBC Essex featuring a big general knowledge quiz! This book is a must for quiz fans and organisers alike. A mixture of hard and quirky questions. Good for a family get together too.